Small African food shop on Southwark Park Road. They have a small selection of fresh vegetables, plus oils, grains, that sort of thing. 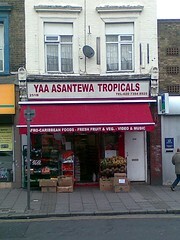 This shop is notable for selling great big bags of Scotch Bonnet chillies for the princely sum of one pound. It will sometimes also sell lemons and nice big lumps of fresh root ginger: an excellent place to stop by if you have a cold. Last visited by doop, early 2008. Last edited 2016-07-11 16:40:04 (version 4; diff). List all versions. Page last edited 2016-07-11 16:40:04 (version 4).